Trucks. Americans love them. In fact, over 2.8 million units are sold per year when you add up all the full- and mid-size offerings from Ford, GM, Ram, Toyota, Nissan, and Honda. That’s a lot of trucks. And their importance goes way beyond the number sold. 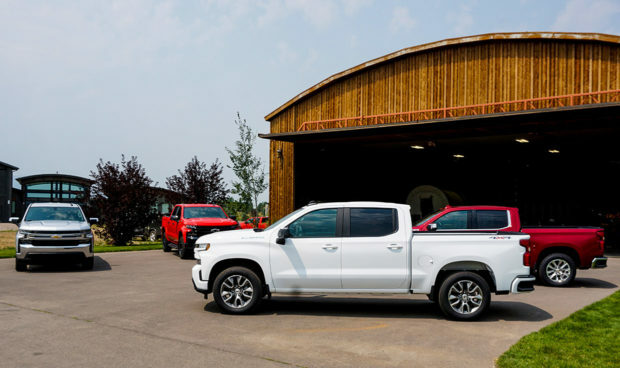 On average, Chevrolet makes between $10,000 and $12,000 on every truck sold (compared to about $1,500 for a passenger car), so when it’s time to introduce a new Silverado, there’s no room for error. That’s how I found myself in Jackson Hole, Wyoming as guests of Chevrolet to be one of the first people to drive the 2019 Silverado in nearly all of its forms. 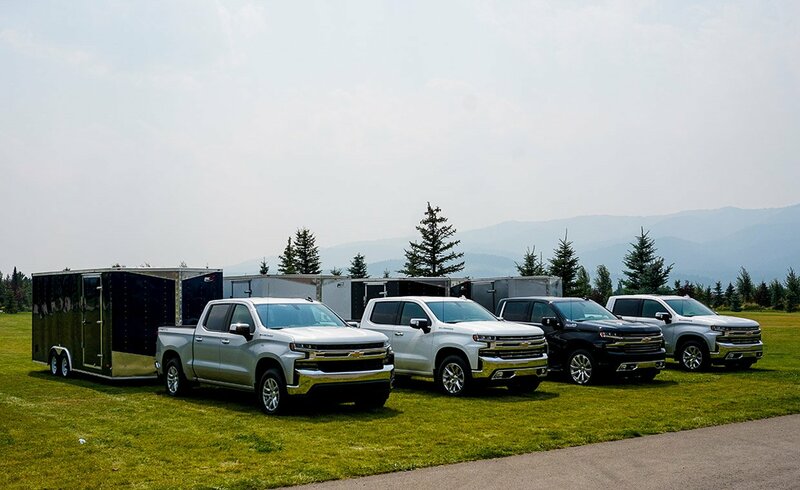 For this generation of truck Chevrolet is changing its strategy from one truck fits many, to a truck for every purpose. 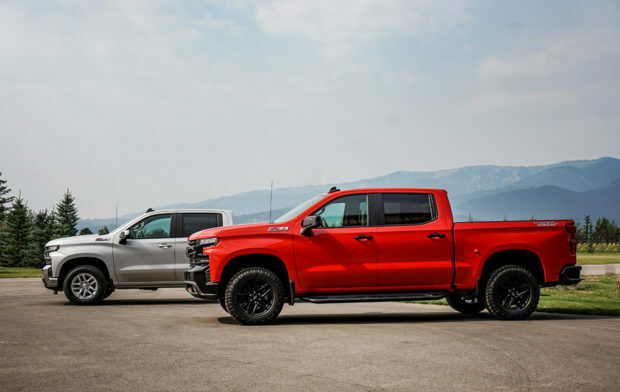 In order to do that they’ve expanded the Silverado line to include 8 trim levels and six engine options allowing you to create the perfect truck for your situation. 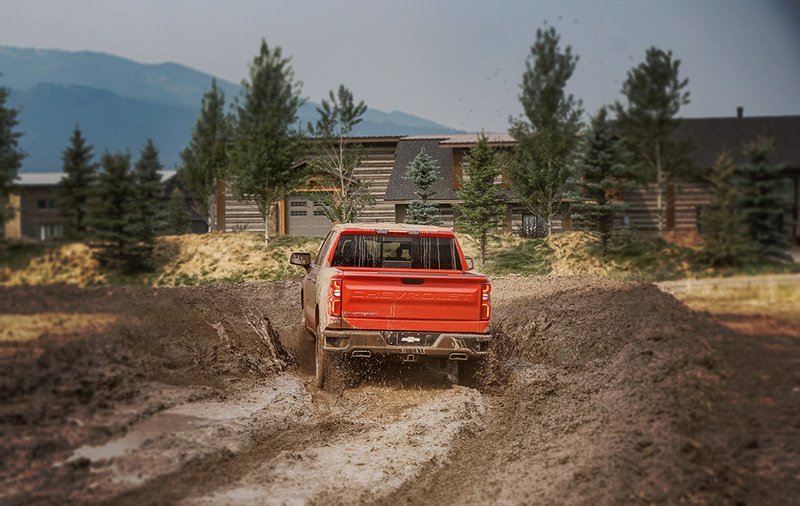 Whether you need an off-road brute with the power to pull redwoods out at the roots or a high mileage hauler to carry your tools to the job site half a state away, you’ll be able to configure your Silverado in a way that works for you. It all starts with the foundation, or in this case the frame, which is all new for 2019. It’s a high-strength steel box frame with seven cross members that’s stronger and more rigid than the previous generation, as well as 88 pounds lighter despite extending the wheelbase by four inches. Overall, the new Silverado is up to 450 pounds lighter thanks to the use of mixed materials (steel, high-strength steel, and aluminum) in appropriate places around the truck. 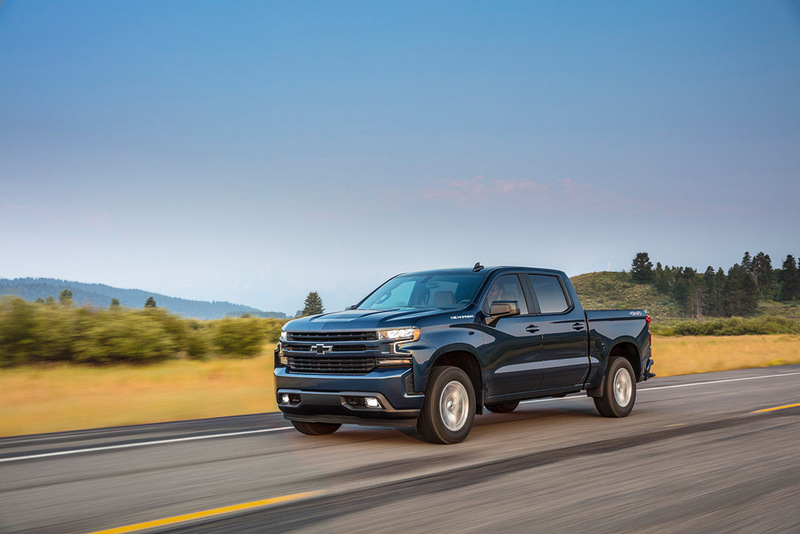 The result is a truck that’s bigger, can haul more, tow more, and carry its passengers more comfortably while offering better ride and handling than ever before. 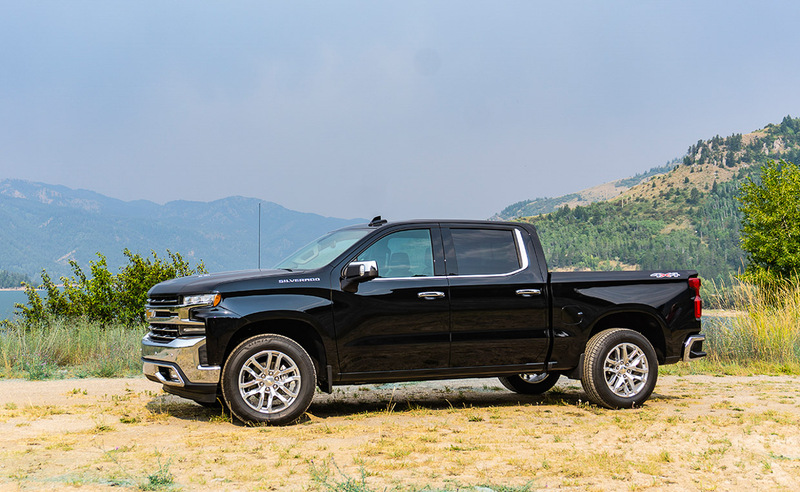 As I mentioned there are eight trim levels available, from a decidedly utilitarian 2WD Work Truck to a fully-loaded near luxury 4WD High Country Crew Cab. Pricing starts at just under $30,000 for a regular cab work truck, and goes up to over $54,000 for a Silverado High Country Short Bed Crew Cab. Tick all the boxes, and you’ll eclipse $60k without too much trouble. 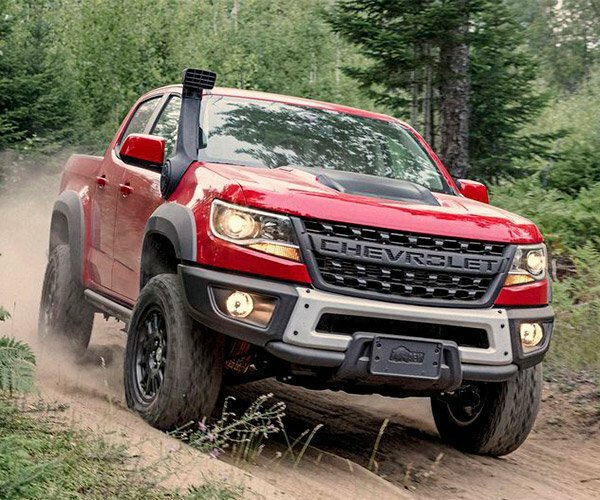 I expect most of the new Silverados to be sold in the mid-level LT, RST, and Trail Boss trims at prices in the low to mid $40K range. Interestingly, the base LT for 2019 is priced $700 less than the current model even though it offers an engine that delivers 22% more torque along with and 8-speed automatic transmission and active aero up front improving overall efficiency. 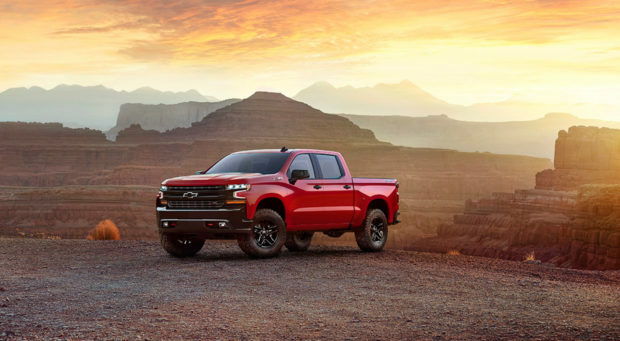 Chevrolet significantly redesigned the Silverado for 2019. Every body panel is new from the roof to the bumpers. Some of the highlights include: a roof panel designed to help smooth the airflow over the bed delivering less drag, rounded wheel openings, sculpted side panels picking up some of the design language from its SUV and crossover line up, a new twin-bar front grill, narrower LED lighting, side vents to route the air around the front wheels, and a short overhang up front make maneuvering the truck in tight spaces easier. 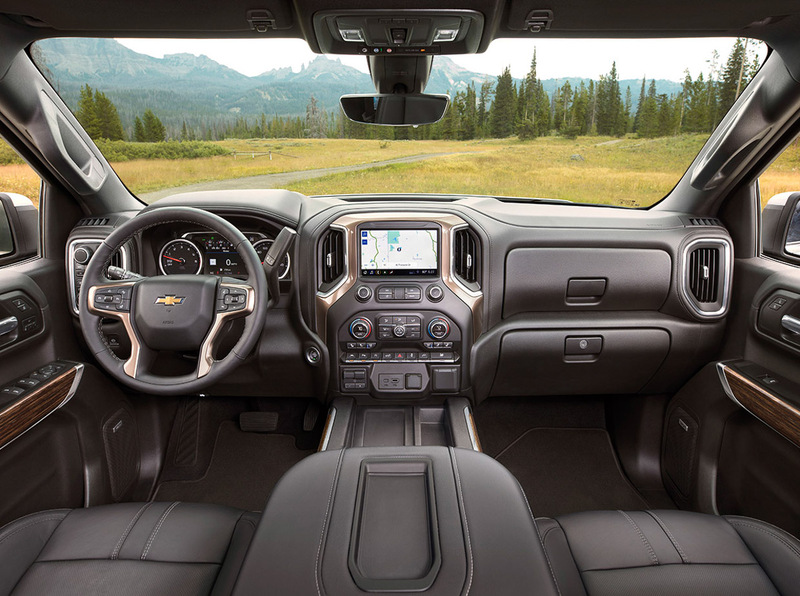 One area of big improvement for the Silverado is behind the cab. It now has the largest box in the category, adding 10 cubic feet to the short and standard box capacity, and 14 cubic feet to the long box thanks to taller sidewalls and less space between the bed’s sidewalls and exterior body panels. The bed is constructed completely of high-strength steel that is nearly 20% stronger than last year’s truck, and includes 12 standard tie-downs that are rated to 500 pounds. There are nine moveable tie-down spaces available, and you can also add a 110/120 volt power outlet near the tailgate. A cab-mounted light is standard, and in-bed lighting is available to help you get your work done after the sun goes down. As for the tailgate, you have four choices there. The standard gate is basic, offering a manual lock. You can move up to a manually locking gate with lift-assist that makes closing it easier. You can get the lift-assist gate with power locks and an automatic release, or you can add a power liftgate so you can raise and lower the gate with a touch of a button on the interior or the key fob. Inside the Silverado, “new” is the watchword here as well, though they haven’t strayed too far from the formula that helped them sell over half a million trucks last year. 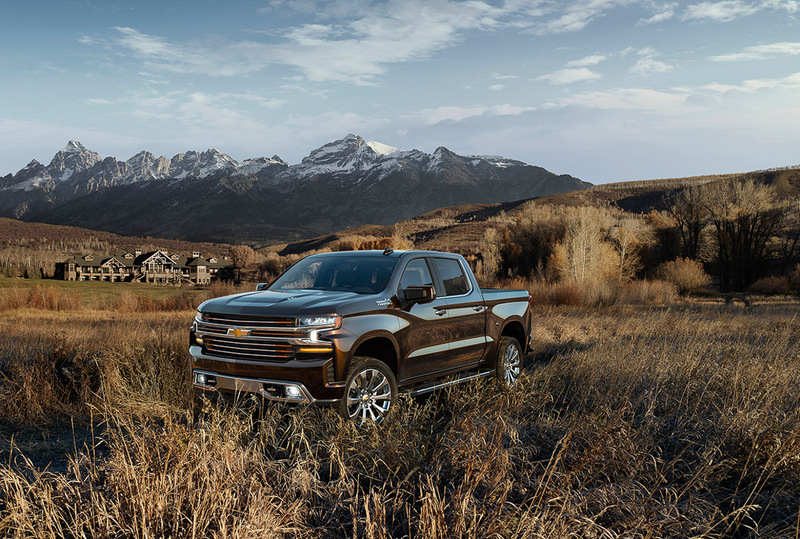 Base and mid-level trims are simple, clean and utilitarian, while the higher level High Country interior with its soft touch surfaces and leather seating competes well with Ford’s King Ranch and Ram’s Long Horn editions. Some of the things I liked best about the new interior include 3 inches of additional rear seat legroom, a huge center console, a large touchscreen for infotainment and nav, easy to use HVAC controls, and actual tuning and volume knobs for the audio controls. The trailer brake control is just to the right of the start/stop button and there are plenty of power ports in the front and rear so no one has to fight to recharge their devices on the road. I drove a 6.2L powered LTZ equipped 4X4 about 75 miles from Jackson to Alpine, Wyoming via Victor, Idaho climbing to 8,432 feet over the Teton Pass along the way. With 420 horsepower and 460 lb.-ft. of torque, the elevation change was no problem for the unladen truck. Power application was smooth and immediate thanks to the 10-speed automatic transmission. One of six engines available, the 6.2-liter gas engine is the largest, and along with the 5.3-liter V8 the first to incorporate Chevy’s new Dynamic Fuel Management system that increases efficiency of large displacement engines. Unlike Active Fuel Management which deactivates cylinders to reduce power and fuel use, Dynamic Fuel Management constantly monitors engine performance and torque needs and directs the engine to fire anywhere from 2 to 8 cylinders in one of 17 patterns. Put your foot to the floor and all 8 cylinders fire, pulling you quickly up to speed. Relax the pedal and the controller determines which and how many cylinders are needed to deliver the performance you’re looking for. Try as I might to sense when cylinders were being shut down, I couldn’t. The transition was seamless and undetectable with the controller making changes in the firing pattern up to 80-times per second. In talking to chief powertrain engineer, Jordan Lee, he said DFM actually operates more smoothly than AFM because they can better balance the firing patterns. As with any new technology, I was also concerned about reliability and was told by Lee that Chevy has put over 7,000,000 miles of real-world testing on the engine to ensure it delivers as promised. Other engines available on the Silverado include the base 4.3L V6 with Active Fuel Management, delivering 285 horsepower and 305 lb.-ft. of torque which is standard in the Work Truck, Custom, and Custom Trail Boss Trims. It’s paired with a 6-speed automatic transmission. The optional powertrain for these trucks is a 5.3-liter V8 with AFM rated at 355 horsepower and 383 lb.-ft. and a 6-speed automatic. The mid-level LT and RST trucks get a turbocharged 2.7-liter I-4 engine with AFM and an 8-speed auto. 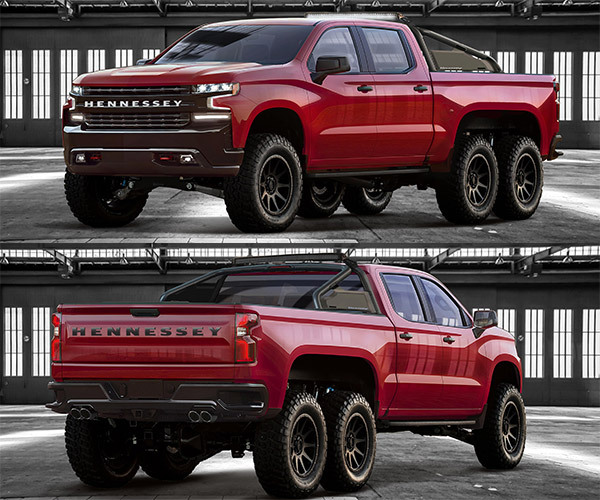 Output for this set up is 310 horsepower and 348 lb.-ft. You can move up to the 5.3-liter V8 with DFM on these trims which increases output to 355 hp and 383 lb.-ft. For the top trim LTZ and High Country trucks the 5.3-literwith DFM is standard and the 6.2L V8 with DFM and 10-speed auto serves as the upgrade. In spring, Chevy will begin selling a Duramax Turbo-Diesel I6 engine and 10-speed automatic transmission combo. Power and efficiency ratings for this set up are TBD. Trailering is another strong point of this truck. 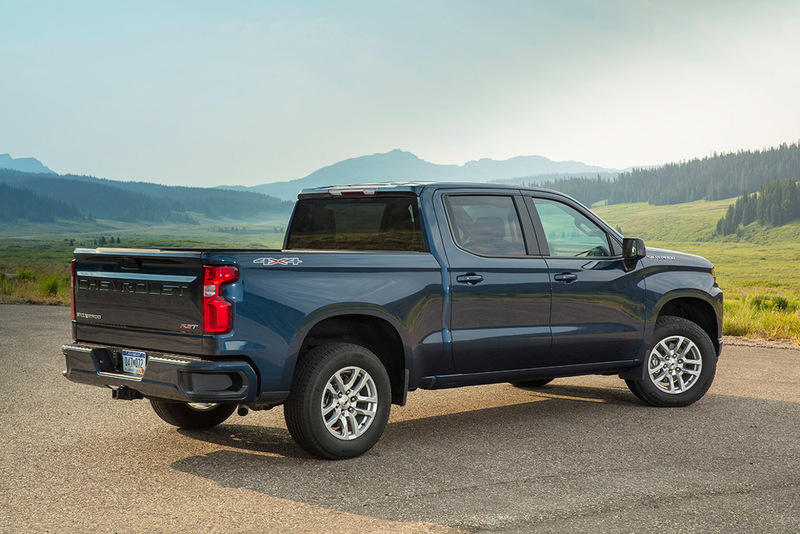 Towing capacity is increased this year by 500 pounds to 12,200 for a short bed crew cab equipped with the 6.2-liter V8 and the max towing package. 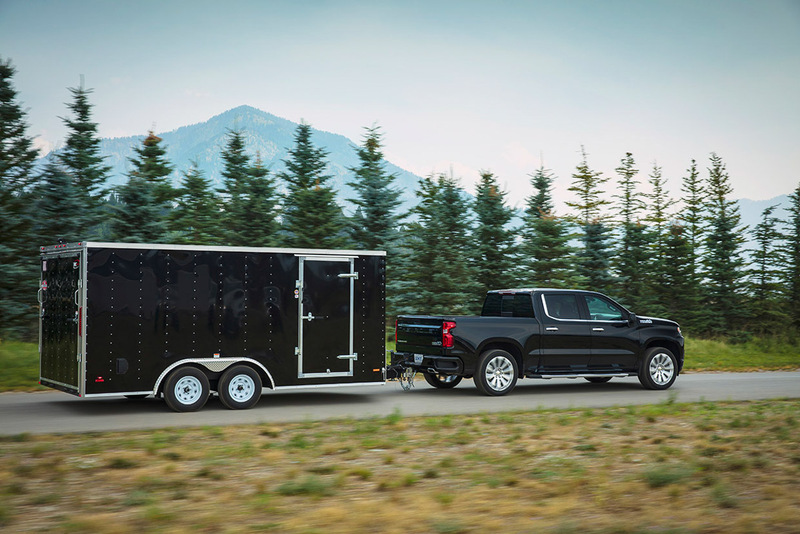 Technology comes into play here with the ability to set up five profiles for different trailers you may be towing. There is a camera mounted in the tailgate with a guidance system to help you back up and align your ball to the trailer hitch. Standard cameras allow you to view the sides of the trailer as you roll down the road and can add a remote camera to the rear of the trailer. Another nice bit of technology is a program that allows you to check your truck and trailer lights without a second person. Just initiate the sequence on via an app on your phone and the lights activate on a preprogrammed sequence as you walk around the truck and trailer. New this year is also the Silverado Trail Boss model. Combining Chevy’s legendary Z71 off-road package with a factory-installed two-inch lift kit, you also get off-road tuned Rancho twin-tube shocks, hill descent control, a two-speed transfer case with an auto locking rear differential, skid plates protecting the oil pan and transfer case, 18-inch wheels with Goodyear Wrangler Duratrac all-terrain tires, and a full suite of safety features. I took the Trail Boss out on a grueling off-road course that featured a start over uneven logs, a loose gravel hill climb, crawling over a bed of large rocks and powering through water and mud. 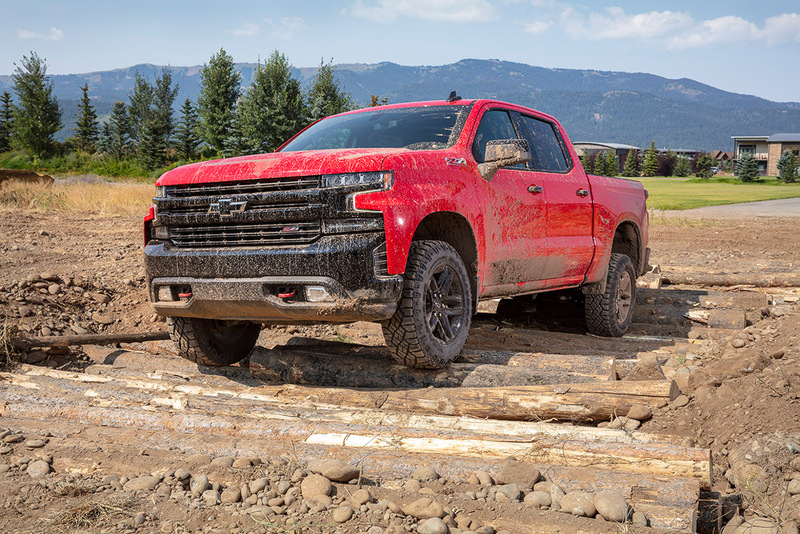 Not surprisingly, since Chevrolet set up the course, the Silverado Trail Boss handled it with ease, but I was impressed with the comfort with which it did it. Even on some really big bumps the suspension never bottomed out and no matter how hard I pushed it, the truck always felt in complete control. The upshot here is that the new Silverado is a big upgrade from the previous generation of trucks from Chevy. It’s more capable, handles better, more efficient, quieter, and more comfortable. And it’s even a little less expensive. If you’re in the market for a full-size pickup, make sure you put this one on your shopping list.